Jewels That Play with Light: Cats and Tigers and Stars, Oh My! The final instalment in our series on jewels that play with light examines three different gems that, while they do not change color, have a unique internal structure that allows light to produce interesting optical effects. 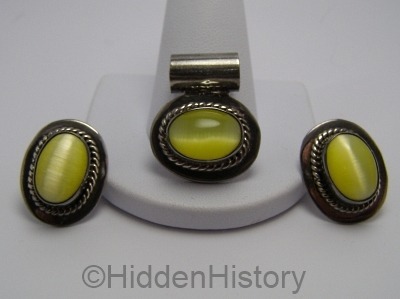 Two of them, popularly known as cat’s eye and tigers eye, are well known. The third family of stones exhibit asterism, an effect that produces a star on the surface. Let’s look at the “feline” stones first. The only stone that can be properly described as being a cat’s eye is the variety of chrysoberyl known as cat’s eye cymophane. 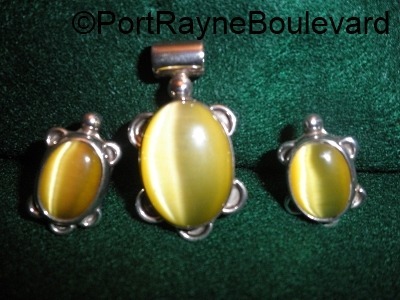 It is formed of beryllium aluminum oxide and appears as a relatively small percentage of the chrysoberyl stones. Although cymophane is often found in Brazil, Africa, and Madagascar the largest and best examples come from Sri Lanka. It is rated between 8 and 8.5 on the Mohs scale of hardness which means it can take a fairly high amount of abuse compared to some other stones often used in jewelry. The color range of cymophane runs from a golden honey color to a mint green, but the highest value colors are a rich gold. There are also stones as pale as yellow and as dark as brown. The usual size seen in the trade is somewhere between 0.10 carat and 3 carats, although there is an 85 carat stone on display in the Museum of Natural History in New York. That is one big cat! The popular name of this stone is taken from the optical effect known as chatoyancy, a term derived from two French words: “chat” meaning cat and “oeil” meaning eye. This reflectance effect occurs because of very fine fibrous inclusions within the cymophane stone. When light hits these inclusions it creates a bright, visually almost white, stripe that appears and runs perpendicular to these internal inclusions. As either the stone or the light source is moved toward one side or the other this narrow white stripe appears to follow it. A stone that is cut as a cabochon oval particularly resembles an actual cats eye with the iris narrowing in response to the ambient light in which the animal finds itself. There is a legend in some Eastern countries that if one brings one of these stones out into the light of a full moon on a clear night, the light reflected by the stone could show you the way to a hidden treasure. Some others stones such as alexandrite, tourmaline and moonstone may occasionally exhibit something that appears to be the chatoyancy effect but the only stone in which it is produced in this particular way is cymophane. Sometimes these other stones are called cats eye but they are properly described differently than in the actual real cats eye which is always called (or should be) cats eye chrysoberyl. As you can imagine, this technicality often causes much confusion! A particularly desirable attribute of some cymophane is what is called the “milk and honey” effect. 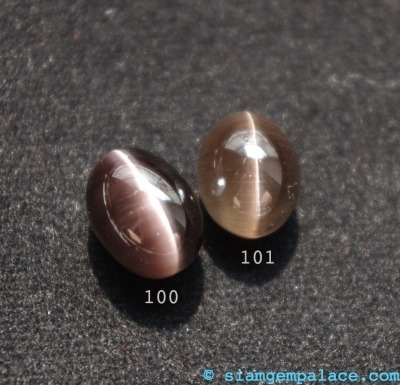 When you direct the light source at one of these stones, one side of the cats eye stripe will be a milky whitish color while the other side of the stripe will remain gold. As the stone is moved in relation to the light source, these two colors will swap positions. This milk and honey effect is especially important in evaluating the overall quality of the stone. Also, the thinner, straighter, and more contrasting the white stripe, the more valuable the stone in question. Some people prefer the green variety because the color is more similar to the actual eye color of many cats. However, the golden tones are more valued in the marketplace. It should be mentioned that there is no such thing as a transparent cats eye, and that the only cut that will produce the desired effect is a cabochon. Some stones exhibiting less than optimal chatoyancy or color can be irradiated. Such a treatment can indeed bring the the color of a rather wishy-washy stone up to the desirable honey brown, and this particular practice was quite popular in the 1990s in the Asian jewelry market. A good stone, from Sri Lanka for example, should never need to be irradiated but if the stone has been treated it should always be disclosed to the potential buyer. Although cymophane is a relatively tough stone it should not be subjected to excessive heat, ultrasonic cleaners or steam jewelry cleaners. It is best cleaned using warm soapy water and perhaps a very soft brush if there is any dirt lodged in its setting. Make sure that it is thoroughly dry before putting it into its storage space. There are a few other stones that are sometimes mistaken for or sold as true cats eye chrysoberyl, such as cats eye tourmaline, apatite and fibrolite which is also known as sillimanite. This last stone was discovered in the early 1800s in Connecticut and was named after an American chemist Benjamin Silliman; it’s alternate name comes from the fact that the interior looks like a bunch of fibers twisted together. Cats eye quartz is also fairly commonly seen but does not deserve the technical appellation. In fact, it is one of these quartz stones that is discussed in the next section. 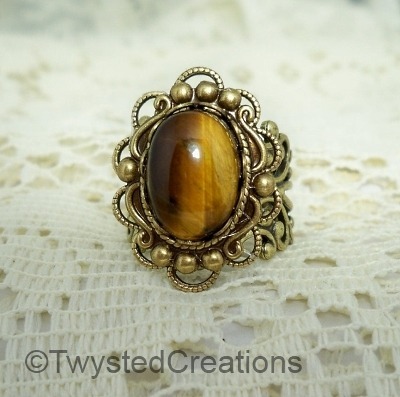 Tigers eye is also a chatoyant gemstone but the effect is not the same as that of cymophane. 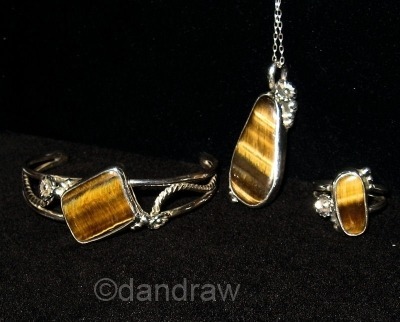 First of all, tigers eye is a quartz although some of the honey colored tigers eye stones are sometimes sold as the true cats eye cymophane, especially if the stone in question does not have significant banding. This banded effect of the lighter and darker areas is reminiscent of the striping on a tiger’s coat. 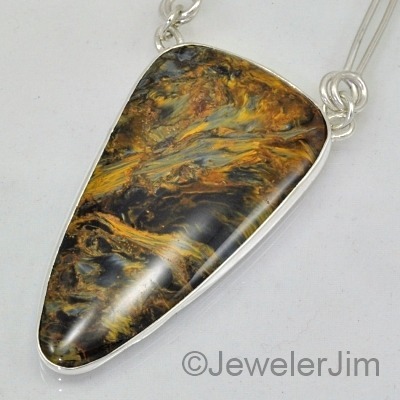 It is a popular stone for men’s jewelry as well as being often formed into beads for necklaces and earrings. It is a bit softer than cymophane, having a hardness of 7 as do most of its quartz family relatives. It has a silky luster and takes a nice high polish easily. The greatest number of mines for this stone are located in Africa but it is also found in somewhat smaller quantities in India, Burma, China, Brazil, Canada and even the USA. It is often found near iron deposits. The technical name for the type of quartz that forms tiger’s eye is cryptocrystalline and indicates its very fibrous nature. 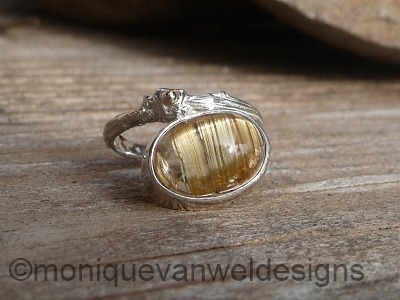 The attractive and unique rutilated quartz ring shown below is a perfect example of how the interior of a stone can contain numerous parallel fibers. Tigers eye comes in a fairly wide range of color but the most common is from golden to reddish brown often in a single stone. There is a gray-blue variant which is known as Hawks Eye, and a multi color swirly variant from Africa known as Pietersite (shown below). 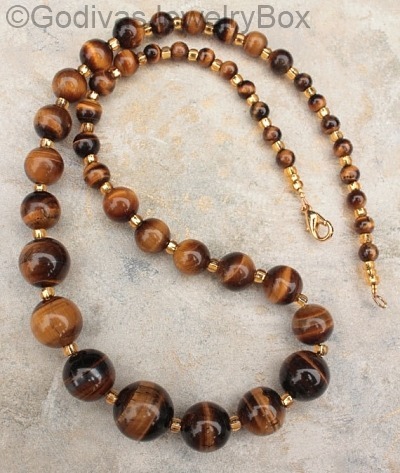 Buyers should be aware that there is a synthetic version of the typical banded variety of tigers eye made from plastic materials and even sometimes from a type of fiber-optic glass. Examples of tigers eye can also reach considerable size, as evidenced by this impressive paperweight in a diameter that covers most of a man’s hand! A gemstone that exhibits the trait of asterism (from the Latin word for star) is sometimes referred to as a star stone. The two most commonly seen are star sapphire and star ruby. In order to produce the star effect on its surface, such a stone must be cut as a cabochon and even then it takes a very skilled cutter to bring out the best star on any individual gem. This asterism is caused by inclusions within the stone, just as chatoyancy is produced in cymophane, but in the case of the star the light is reflected in more than a single band or direction. As a result, any given stone may have as few as four rays in its star or in the case of some really spectacular gems as many as 12 rays – such stones are known as double stars because the most common number of rays is six. A ruby can be classified as a star ruby if when light hits the stone it produces a crisp clear star effect. Although in most gemstones the presence of inclusions is considered to be a detriment, in the star stones this actually is an advantage because otherwise this unique effect would not appear. A star ruby of fine quality overall may be worth more than a ruby that does not have the required inclusions to produce this effect. The Smithsonian Institute houses an extremely large and fine quality star ruby weighing 137 carats. However, the world’s largest star ruby is the Rajaratna, weighing 2475 carats. But perhaps the most amazing star ruby of all is the famous Neelanjali Ruby which is known as a double star ruby because it has a 12 pointed star; it weighs in at an impressive 1370 carats. Although such wondrous specimens do exist, nowadays most star rubies today are synthetic stones rather than natural ones. Most people are more familiar with star sapphire than with its cousin the star ruby. Star sapphires usually display a three ray star which produces six individual points. 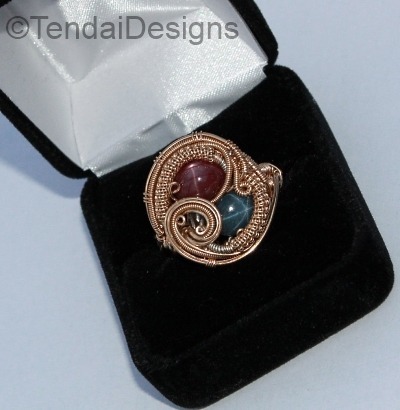 Just as with the rubies of this type, these stones are always cut in a cabochon. 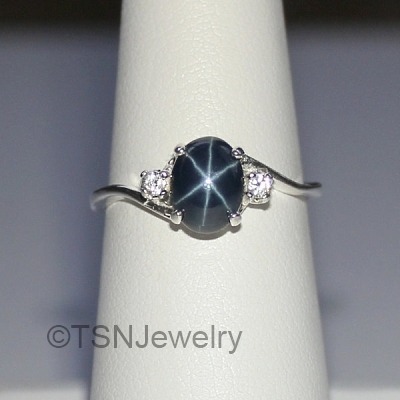 Star sapphires are most often found in shades of blue, but there is a type that is sometimes called a black star sapphire which in reality is an extremely dark brown or very dark green when closely inspected. Although sapphires in nature also occur in orange, yellow and pink, it is rare to find these colors with asterism. Natural star sapphires are hardly ever treated to enhance or change their color, because the application of heat carries a high risk of destroying the internal inclusions of rutile that produce the star effect. In any case, the most typical sapphire blue color of the natural stone is usually the one most desired in the star versions as well. In 1947 the Linde company patented a process to produce star sapphires in a laboratory. 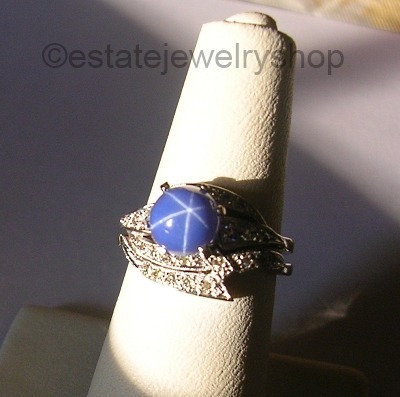 These stones became extremely popular and back in my high school days I was very proud of a Linde star ring of my own. Unfortunately it was lost over the years but it was one of my favorite pieces of jewelry as a teenager. They were extremely well-made and many of these synthetic star sapphires were and still are mistakenly sold or regarded today as natural stones. However, there are a few ways to check on whether a given blue star sapphire is a natural or a synthetic stone made by Linde. First, look at the bottom of the stone if it is visible with in its setting; if there is a capital L on the stone then it is a Linde star. You will probably need a magnifier of at least 10 X to see it, especially if the stone is not a large one. The next thing is to look critically at it for imperfections. In the case of the Linde stars, the stone will probably appear too perfect to be true. The underside of the Linde stones are almost always perfectly smooth and even, which does not always occur with a natural stone even with the best cutter and polisher. But you may not be able to see the underside and so the next thing to look at is the star, using a flashlight or other strong concentrated source of light to examine it. Are all of the rays of the star absolutely consistent in their length, thickness and straightness? If so, it is probably a synthetic stone because Nature is rarely that precise. But just to make sure, try moving your light source around the stone in a circular motion. In a natural star sapphire, the star itself will shift to almost follow the source of the light. A synthetic star will stay at the top center of the stone with a little or no shift of position of the star’s rays. If you are still uncertain and the price of the stone warrants it, you can take it to a jeweler for a professional gem testing which will tell you whether or not the stone in question is corundum (sapphire) or not. If I recall correctly, Linde also produced a black star sapphire as well as their trademark blue (shown below). Occasionally some other gems can exhibit an unexpected degree of asterism. This trait has been found in quartz, sunstone, aquamarine, blue topaz, spinel and quite a few others. A very interesting collectors forum gallery of such unusual star gems may be found on this page of the gemologyonline.com site. Whether your taste runs to cats, tigers or stars there is sure to be just the right stone for you among the jewels that play with light! Many thanks to the Etsy sellers who kindly gave permission for me to use their photographs to illustrate this article; each of those images is a live link to that item’s listing.